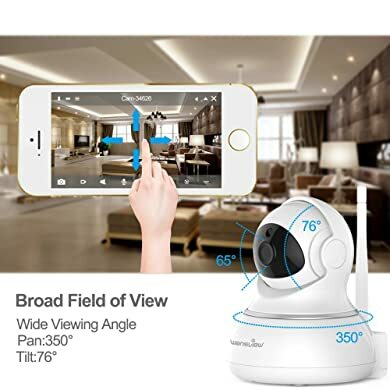 If you want a sleek-looking camera that allows you to pan or zoom your view, the Wansview Wireless IP Camera might be a great product for you to check out. It has a high-definition vision of day and night with a confounding 720 dpi resolution. Connect your device to a WiFi, and you can see what’s happening in your home. Try controlling the device with your mobile app or PC for you to tilt or rotate the camera. This means, you can check on your child or pet any time of the day, whether you’re near or far, and in any angle you want. The camera has been lovingly called by many as a “little robot” because it resembles one. Before you can say, “Cute!” the device, however, shouts more elegance and chic in design. Other than its pan and tilt features, it has a built-in storage space for a staggering 128GB micro SD card. 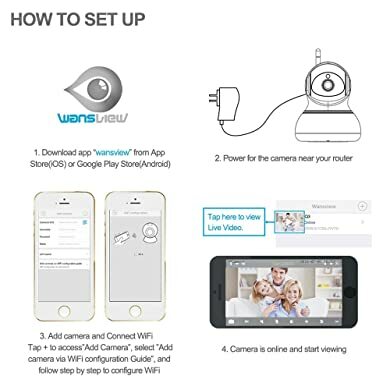 The Wansview camera is wireless and highly dependent on WiFi for it to work. The 720 dpi version of the camera can run and live stream videos on your PC and smartphone for six days. Users can also customize its brightness and saturation accordingly to what they want. If one needs to be notified of anything happening in the house, the device can send photos or videos through email. What’s more, it can sense four motion activities. The device can pan, zoom, or tilt on a certain angle, controlled by your phone or computer. Users can have a view of 65 degrees wide while being able to have a horizontal panorama of 290 degrees. Tilting the camera up and down can give you a 120-degree viewing of the room. Meanwhile, one can also zoom their view up to four times, so that he or she can meticulously observe the premise. The camera has a standard HD 720 dpi which can run up to six days. If your WiFi connection is good, it can live stream videos at 25 or up to 30 frames per second. As stated, users can customize their display settings in case they want their videos lighter or sharp. Exporting or downloading the photos to your email will leave you with MP4 or H.264 and MJPEG files. 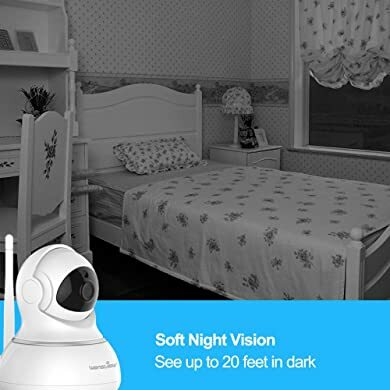 Wansview supports night vision specs at 720 dpi and boasts of giving you a view of up to 30 feet. In its settings, users can manually change whether they prefer the night vision in colors or black and white – especially in dim areas. The device can handle up to 128GB and has the option to let users play back the videos of up to 24 hours. Images stored can be sent through email while videos have their limits. Other dpi versions of the camera let users record and live stream videos up to 48 days. But note this: the lower the dpi, the greater the capacity it has to store because it does not have that size that can take too much space. It has built-in features which allow people to talk and listen through smartphones and the Wansview app directly. Its audio interface supports at 3.5mm. What’s more is that the device has an audio jack in case anyone would plug in a headset with speakers. Technically, the Wansview was created for indoor security and would operate at a temperature of -10 degrees to 50 degrees Celsius. It’s not waterproof, and users would have it placed under a roof. The camera has a built-in alarm jack for sirens or alarm signals to be placed. So, when things go awry, owners can set up the alarm. 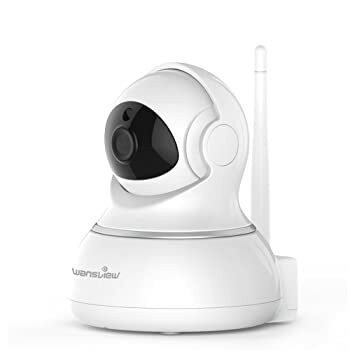 The Wansview Wireless IP camera is set up indoors where it is dry. Before installing the device, make sure your PC and smartphone have the requirements conducive for the camera. For desktop users, your computer should have the specs with a minimum memory size of 256MB. Display cards should reach 64M for the camera’s video resolution and imaging to work. Some should have at least Windows 7 or Vista or Mac OS to use. While most phones can support the Wansview camera, just take note that an Android version of 2.2 and iOS4.3 would be nice to have. The device has a great and convenient pan, zoom, and tilt features that let users rotate and zoom in to see what they need to be seeing. All they need is to swipe left, right, up or down to see the nooks and corners of the room. The camera may zoom up to four times, but other wireless cameras let users zoom up to eight times more. Wansview has an easy-to-reach Wifi range. Users reported of having a distance of up to 100 feet. The night vision features at least let people choose the color or black and white display. More so, sometimes, colors often distract the users of noticing anything ruckus happening. Around 20 to 30 feet worth of view is already a magnificent feat for the camera. It’s an easy setup and wouldn’t bother much the user with it. One can just use WiFi and the QR code to download the app. The storage is pretty big enough for one to accumulate images and videos too. It has great audio and speaker built for you to talk to your child or your pet! And in case burglars come in, you can set up your alarm system with the camera and capture everything. Users experience delays on audio. One must have a great WiFi connection for a seamless two-way conversation. There are some static interference or noise from the audio when one talks. Sketchy motion detection is a bit tricky. The device wouldn’t work at times. The night vision is seemingly alright, but other cameras offer 11 IR LEDs for better monitoring during the evening. Though Wansview has a pretty nice setting for its night vision as well. The resolution is more a tug of war between, “You either hate it or love it.” In other words, it’s okay. Can only be used indoors. This “little robot” might melt the hearts of many with its panning and tilting features with a simple swipe. It gives users more sense of view because it can zoom in up to four times. For a camera that has 720 HD, it can pretty offer a decent resolution and storage size on its bin. The device has its imperfections, especially with its audio tuning and refinement. Talking with the Wansview camera may also induce some delays in communication. Also, the fact that it can only be used indoors makes the camera limited to that niche. 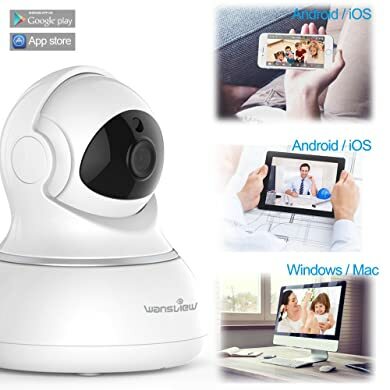 All in all, Wansview Wireless IP Camera makes a fine security camera for monitoring anything rowdy or sketchy going inside your home. Users can plug in an alarm signal when a burglary happens – or when your dog ate your dinner! Just remember its specs and the requirement you’ll be needing, and you’re ready to go.